Take your Wings of War game into the thid dimension! 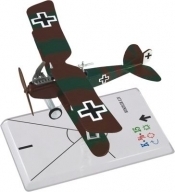 Each historically-accurate, fully painted miniature represents a famous World War I aircraft from the best-selling Wings of War game. All miniatures come complete with maneuver and variable-altitude stand. Outfly and outfight your friends like never before! Other products in the "Wings of War" series.